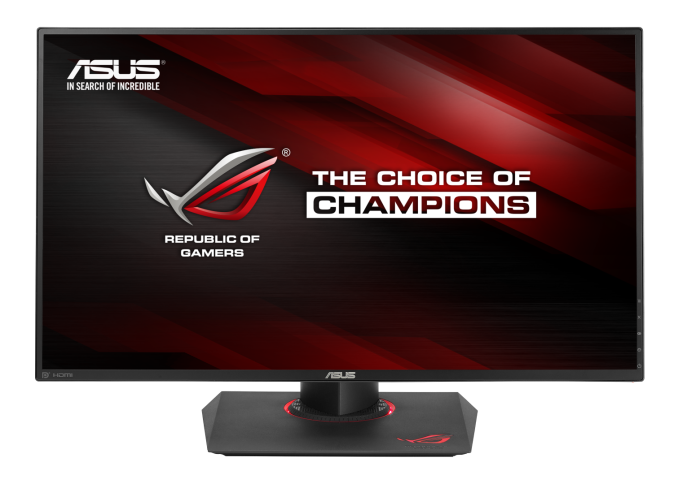 Today ASUS announced two new gaming monitors at their Republic of Gamers Unleashed event in San Francisco. Both displays are 27" IPS panels, although there are some significant differences between the two that make each one appeal more or less for certain genres of games. Below you can find all the relevant specifications for both of ASUS's new monitors. Starting with the PG279Q, we see that it's a 27" WQHD IPS panel with a refresh rate of 144Hz. This monitor is definitely targeted more toward gamers who play games like first person shooters where a high refresh rate is a greater asset than a higher resolution. When paired with a GTX 960 or faster NVIDIA GPU the display's refresh rate can be boosted up to 165Hz, and ASUS has even included a button on the monitor to switch between the two refresh rates on command. This is actually more useful then it sounds, because a user can easily move to 165Hz while gaming, and stick with 144Hz in typical use which will also eliminate telecine judder in 24fps video content. As for the PG27AQ, I would imagine that gamers who play RTS and simulation games would choose it over the PG279Q for its higher resolution. It's a 27" UHD panel with a refresh rate of 60Hz, and a greater 10bit color depth than the PG279Q's 8bit color. It shares most of the remaining specifications with the PG279Q, including a contrast ratio of 1000:1, a 4ms grey to grey response time, a 178 degree viewing angle on both axis, and the inputs and outputs listed above. Both of these new monitors feature NVIDIA's G-Sync adaptive refresh rate technology. Even on the PG27AQ this can be useful despite it only being a 60Hz panel, as it will produce a much more fluid image if a game's frame rate drops below 60fps than a non G-Sync / FreeSync display. However, only the PG279Q has NVIDIA's Ultra Low Motion Blur technology which uses a strobing backlight to reduce motion blur. It's worth noting that G-Sync and ULMB are mutually exclusive and you need to choose which one you want a game to use based on whether or not you can maintain the PG279Q's native refresh rate of 144/165Hz. 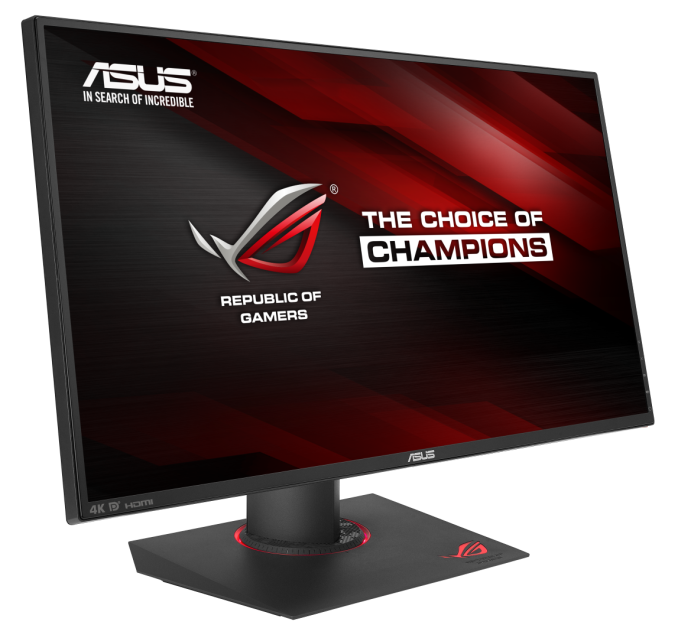 The ASUS PG279Q will be available in November, with a starting price of $799 in the United States. Pricing and availability for the PG27AQ is currently unknown, but I would imagine that the price will be in the same realm as the PG279Q. That's what I'm looking for as well. I don't understand why not even a single manufacturer publishes true viewing angle figures. They might just as well publish nothing other than the panel type because the viewing angle "spec" is meaningless.